This eggless Rich and Moist Zucchini Cake is my new favorite way to eat vegetables. 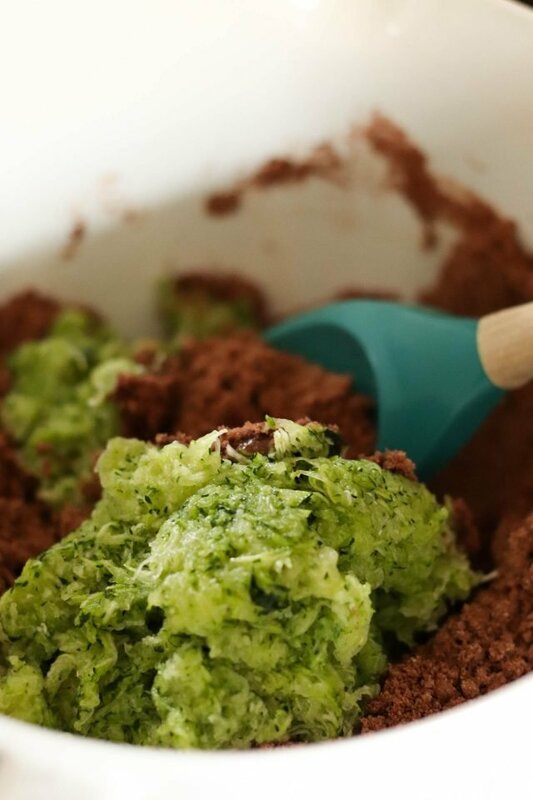 The zucchini makes the cake so moist, you would never even know there is a vegetable in it. If you have never had zucchini cake, this is definitely a cake I recommend trying. And no – we promise!- you can’t taste the zucchini. It really just makes the cake so much more moist and delicious. My mother-in-law used to make this for my husband when he was growing up and he requested that I make it. It was a huge hit. 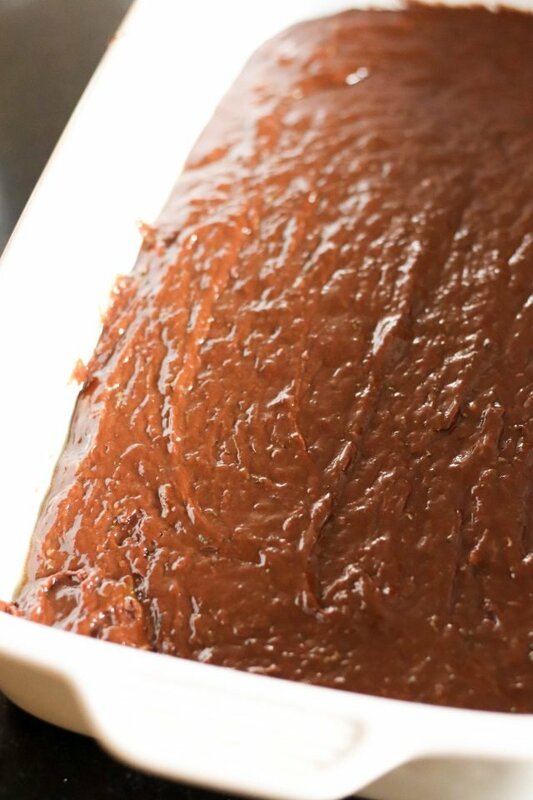 Who would have thought that a veggie would make a moist and delicious cake? Do you really not need eggs for this cake? No eggs. Really! 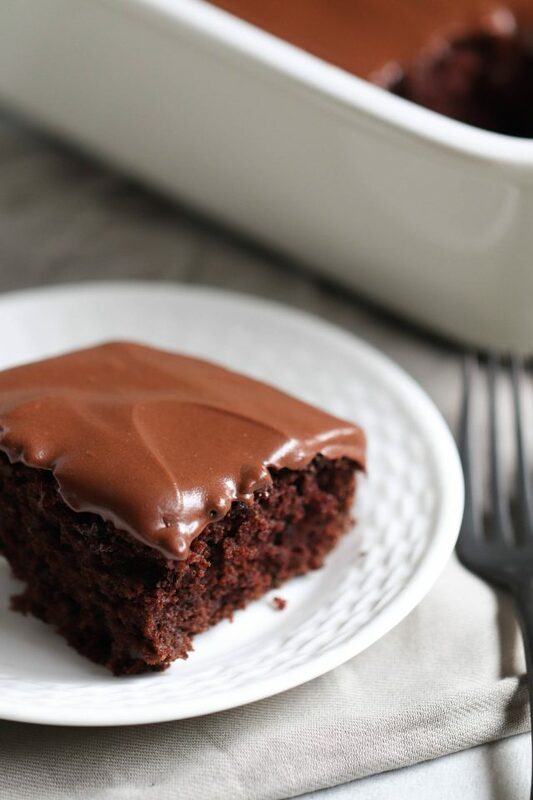 The moisture from the zucchini is enough to ensure a dense, moist chocolate cake. Do I need to peel my zucchini? No. 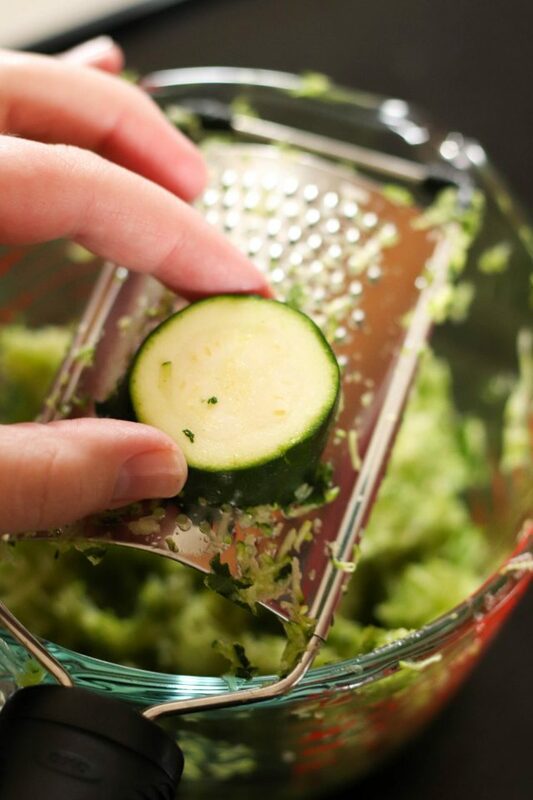 If you finely shred your zucchini (we used a grater like this), you won’t be able to tell if it is peeled or not. You can peel it if you’d like to, but it’s not necessary. Why is my cake so dry? Depending on where you live (the altitude, the humidity, etc. ), you will need to take that into account for the recipe. At the lower altitude where I live, I usually have to add more flour. The mixture looked dry (see the picture after step 2 below) until I added the zucchini (I didn’t drain any of the water from it) and it turned into a perfect batter-like consistency. Why is my cake so runny? See the above question – you may have to adjust! You can always squeeze the excess moisture from the zucchini if you’re worried about it being too wet, and add it in later if it’s too dry. Preheat oven to 350 degrees F (175 degrees C). Grease and flour a 9×13 inch baking pan. In a large bowl, mix together the oil, sugar and 2 teaspoons vanilla until well blended. 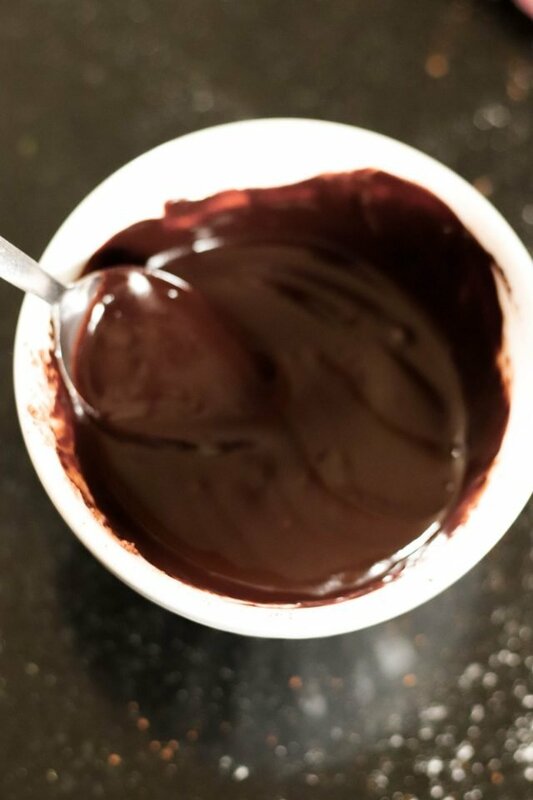 In a smaller bowl, combine the flour, 1/2 cup cocoa, baking soda and salt; stir into the sugar mixture. Fold in the zucchini and walnuts (optional). Spread evenly into the prepared pan. It should be the consistency of cake mix. Bake for 25 to 30 minutes in the preheated oven, until cake springs back when gently touched. To make the frosting, melt together 6 tablespoons of cocoa and margarine; set aside to cool. In a medium bowl, blend together the confectioners’ sugar, milk and 1/2 teaspoon vanilla. Stir in the cocoa mixture. Spread over cooled cake before cutting. Looking for more zucchini recipes? 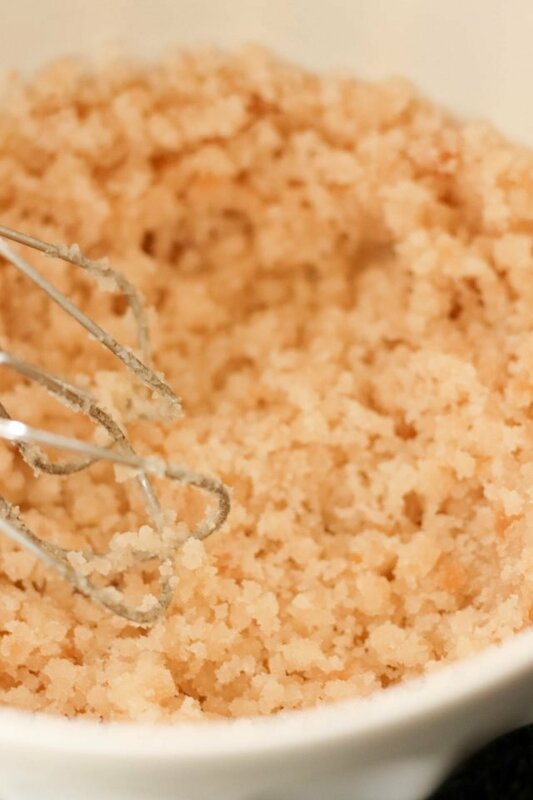 In a large bowl, mix together the oil, sugar and 2 teaspoons vanilla until well blended. Combine the flour, 1/2 cup cocoa, baking soda and salt; stir into the sugar mixture. Fold in the zucchini and walnuts (optional). Spread evenly into the prepared pan. Melt together the 6 tablespoons of cocoa and margarine; set aside to cool. In a medium bowl, blend together the confectioners' sugar, milk and 1/2 teaspoon vanilla. Stir in the cocoa mixture. Spread over cooled cake before cutting. I will definitely have to try this! Zucchini is one of the best crops in our garden this year...and I am getting tired of the only 2 ways I cook it. Cake would be great! Thanks. This cake looks awesome! Thanks for sharing and linking to TMTT. Wow, this looks amazing! You guys have the best recipes here. Love them all, really! Thank you for sharing this at Show & Share! I really appreciate it! No eggs? Is that true? Please let me know. This cake sounds delicious! I was thinking the same thing when I read the recipe. I've never seen a cake recipe without eggs. Katie- No eggs!! I know- I was worried that it wouldn't turn out without them, but it was AWESOME! What a delicious cake! 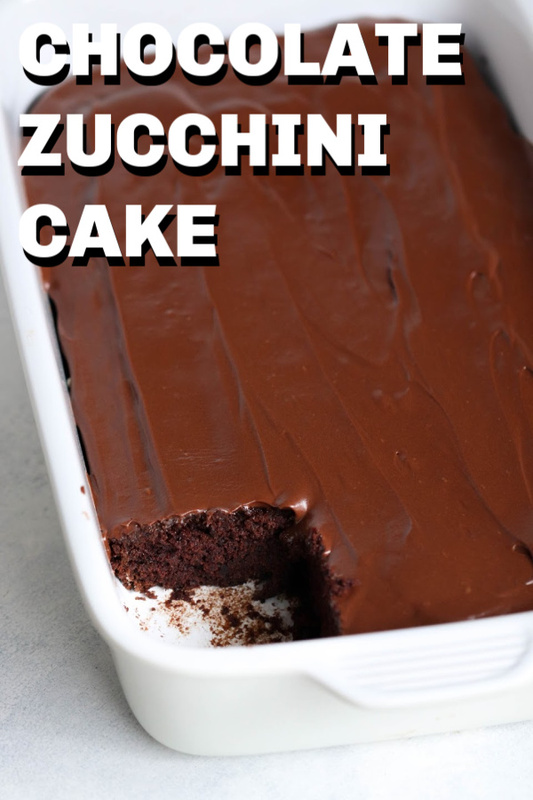 Looks so moist... Chocolate and zucchini- a perfect combination of flavors! Thank you so much for sharing! My friend made this for a group of us. BEST CAKE I EVER HAD. Did you peel the zucchini before shredding? This is my goto "brownie" recipe! I don't peel the zucchini, just do a fine shred. Also, I never use the oil, I sub unsweetened applesauce. So good! For any who are frantically thinking that surely you need to add some liquid...once you add the zucchini it will provide the liquid needed. This was a great recipe, and I pinned it so I'll make it again. OOOMG! This cake was sooooo good! I am making it again for the second time after just a week, Girls, you've created a monster. Guess we'll just have to do a few more miles on the bike....it's worth it. I made this and it was great. I thought the batter was awful dry, until I added the zucchini and it was perfect. Thanks for the great recipe! How do you shred zucchini? Thanks! Amazing. I used 2 eggs and 3/4 cup oil, instead of 1/2. Super moist. Came out perfect. Baked for 25 minutes uncovered, then tented with foil for another 5. Delicious. ABSOLUTELY AMAZING! I made this cake yesterday and it was a huge hit! The cake it's self is one of the best I've ever had. The kids had no idea it had veggies in it! I also added two eggs and as someone else pointed out..the batter will seem to thick until you add the zucchini! Thank you so much for sharing! I don't know how I'm going to frost this..It looks like a chocolate crumb cake..Very dry..Next time I will add more oil and maybe some eggs. I tried to leave a comment, looking for help, but it doesn't show :( REALLY need help to understand why it isn't done cooking after 30min!! DESPERATE. Any luck getting it to cook through? I'm having the same issue. After 30 min not springing back to touch and toothpick comes out gooey. Whenever I shred zucchini there is so much 'juice' that runs off. My question iS how much water do I want to She'd before adding the zuccHini to the mix? Thanks! Try to drain the water off so that you just measure zucchini in the recipe. There is still a lot of liquid in the zucchini itself. So draining extra liquid off is great! I just finished mixing the cake up and even after I added the zucchini, it was still too dry. I added eggs so I hope it turns out. It is in the oven right now. I had no luck with this recipe and followed it completely. This did not turn out at all for me, This was very dry ;( I thought it was strange there was no egg. This is a GREAT recipe! I had all the ingredients in my house and was able to whip up a batch. I was concerned before adding in the zucchini b/c the mixture in the bowl looked so dry. It all came together beautifully. I followed the recipe exactly and they're awesome! I was anxious to eat/try them and share. I asked my husband what he thought and he said, "You can't taste the zucchini." The frosting is wonderful too! I'll keep this recipe handy! Great recipe! I will say I added 1 egg, but very moist and good. Love the frosting. There's got to be a typo in this recipe. I followed it exactly and ended up with a "batter" the consistency of damp sand. I'm wondering if it's supposed to use 1.5 cups of oil instead of .5 cups as listed. Something weird here. I added 2 eggs and used more like 3/4 cup of oil. Even still, the batter was very thick. I had to spread it over the bottom of my baking dish. It's in the oven now. Hope it turns out. Absolutely gutted. Follower this recipe tot he tee. Checked over and over again to make sure it was all correct. Something in your recipient is definitely missing. Needs correcting ASAP as people are wasting their time money and effort making this. It was more like a biscuit batter and I baked t thinking it would blend together but no. It came out the same as I put it in. So very annoyed I’ve wasted half of my morning with this. It’s odd that some people have had cakes that didn’t cook through (too moist?) whilst others had dry cake batter (this was my experience). Perhaps it depends on how much moisture your zucchini happens to have? I added enough water to make a loose batter. 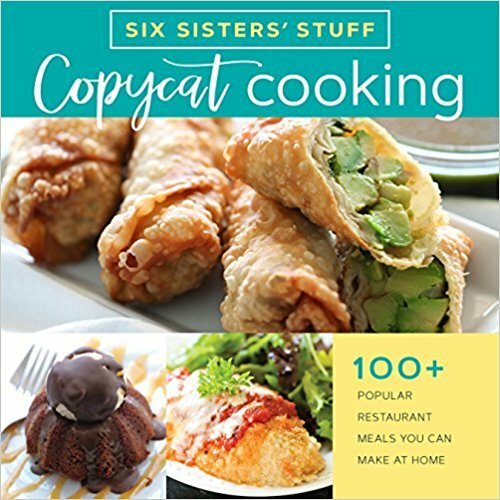 Other similar recipes add up to a cup of water. It turned out fine. This way the cake remains vegan. I was also worried about the consistency of the batter. I baked it for 30 minutes even though it didn’t spring back. Once it waes cooled and had the icing on it it tasted like a fudgy brownie. I would make this again.